A stained glass window gifted by the Polish troops as a souvenir of their stay in the Borders was unveiled in the Church by Archbishop A J McDonald O.S.B. The window was the work of Lt Bunsch, (1896-1969), a distinguished soldier artist and adorns the Lady Chapel. For more information about the artist (in Polish) click here. The central feature is the Black Madonna of Częestochowa around which are grouped panel scenes portraying the Annuciation, the Holy Virgin’s grief at the tomb of Christ, and her Assumption. Bands of azure blue and white bring the panels to unity with the centrepiece, beneath which a Polish Eagle, surmounted by the Latin – “Queen of Poland, pray for us” – keeps the donors in remembrance. Another striking example of his work in Britain can be found at the Polish Church in Devonia Road in Islington. Click on the above link to view one of the windows. The window depicts a soldier of the Second Republic defeated in the September Campaign and the transferal of the battle flag to the soldier outside the country. Dziennik Żołnierza ran an article with the above heading about the stain glass window in their 3rd February 1943 edition of the paper. Ceremonies took place on Tuesday 2nd February 1943. 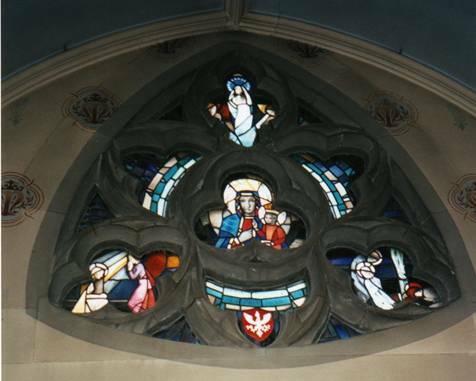 The cost of the stained glass windows was paid for by Polish soldiers. Up to March 1999 a Polish Club existed in Galashiels. The club had been a great source of social contact, especially for the Polish parishioners of Our Lady and St Andrew. Much hard work and effort was put in to the Club by the late Stanisław Osuchowski (formerly of the Polish 24th Lancers).